Happy Talk Like A Pirate Day! 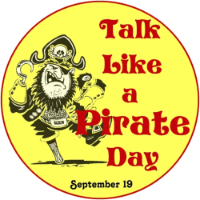 Today is a day to celebrate talking like a pirate. So argghh and avast ye mateys, before I make ye walk the plank, I gots a very special treat in store; the first scene from the first draft to a pirate play I started writing last January and kind of put on the back burner for awhile. At rise, we join a play already in progress. crouched behind the Princess in obvious fright. going to happen to our lovely Princess? everyone is flat, without enthusiasm or energy. of this however is helping with the acting. Oh if only Captain Protein was here. he’d rescue us. and her sproutlings, what shall we do with them? And serve ’em with gravy eh! Beat as everyone pauses and looks at Tim. and we’ll DIP THEM IN RANCH! DIP IN RANCH! DIP IN RANCH! DIP IN RANCH! with much enthusiasm, to ad-lib their lines. would you two shut up! joined by a SUPERHERO! Shorts over tights. far, the worst superhero costume known to man. Not by the seeds of my hamburger bun. Stop him boys! punches that send pirates flying left and right. hitting the pirate crew ala 1960s Batman TV show. their life. Overly dramatic and makes no sense. the quickest side hug she can. I’d love to hear your thoughts so leave them in the comment section below, this is meant to be a very broad, very over the top production for children to perform and for children in the audience.